[Ideal Choice for Decoration:] Classic style and warm glow brightness, crystal clear and metal base, perfect replacement for decorative light strands, commercial light strings and ornamental Fixtures which have the cap base with E17, and can also be used elsewhere such as residential homes or commercial locations. 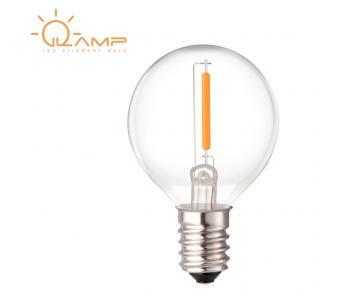 A better way to upgrade your incandescent bulbs of outdoor strands light with Svater G40 E17 base LED filament bulb. Bright enough and creates a gorgeous Omni-directional illuminating effect for any occasion with 2700K warm pleasant light and gentle on the eyes. Made of clear glass all the way down to the screw base, provide 360 Degrees Full Beam Angle warm glow 2700k light.